A FINE GREEN MARBLE AND GILT MANTEL TIMEPIECE. CIRCA 1818. 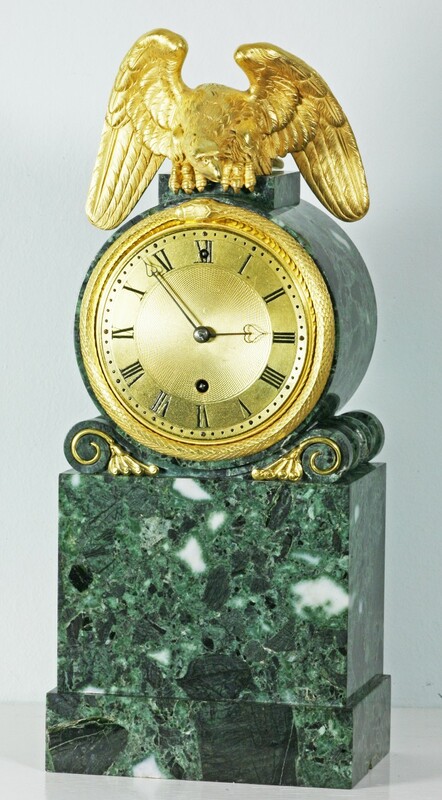 An extremely attractive green Welsh marble mantel clock. The case of a style frequently used by Vulliamy, takes the form of a drum shaped top surmounted by an ormolu eagle with scrolled mounts to the rectangular plinthed base. The dial of the clock, again typical of many of the clocks produced by Benjamin Lewis Vulliamy during this period, has a gilded engine turned centre with black engraved Roman numerals and is surmounted by a gilded serpent swallowing its own tail, which has its roots in Greek ancient history and symbolizes ‘coming full circle’ . The blued steel hands are beautifully fretted out with heart shaped pointers. All the original fire gilding has survived and has just been lightly cleaned. The eight day gut fusee movement is of the finest quality and has rise and fall regulation of the pendulum via a small turn screw in the dial at XII. 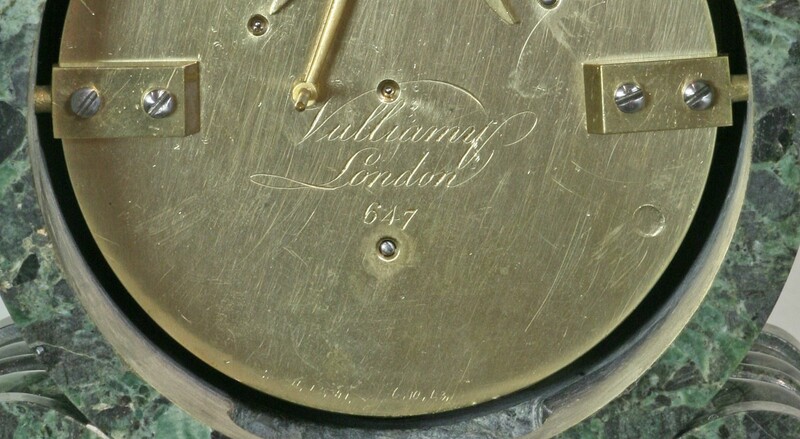 The pendulum, movement and case are all numbered 647 and in addition the backplate of the movement has the signature for Vulliamy, London. These mantel clocks were cased in a variety of different marbles but the green Mona marble, which was mined in Wales, is one of the most unusual. It is found in two areas, but this greener variety was mined on Holy Island and the adjacent mainland of Anglesey. 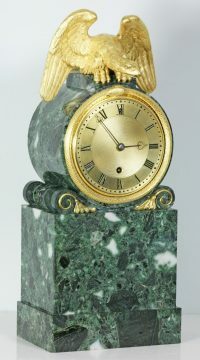 In addition to these small mantel timepieces, there are other examples with much enlarged and elongated bases with resting lions to the side of the drum shaped clock. October 1951 acquired from Stuart & Turner, London. D. Fennimore ‘The David and Peggy Rockefeller Collection New York 1992’, Vol 1V, page P300, Number 314. 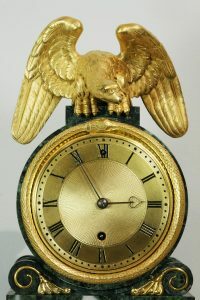 Benjamin Lewis Vulliamy was the last of a line of exceptional clockmakers in the Vulliamy family, the first of which was François Justin (always known as Justin Vulliamy), followed by his son Benjamin, followed by his sons Benjamin Lewis and Justin Theodore. Benjamin Lewis Vulliamy was born on the 25th January 1780, not a lot is known about his childhood except that he spent most of it at 68 Pall Mall. He joined his father in Pall Mall very early in life, certainly when less than 20 years of age. He received the Freedom of the Clockmakers’ Company in December 1809 and became a liveryman in January 1810 at the age of 30 and was admitted to the Court of Guild in the same year. There he served every office in the Court and was five times elected Master. 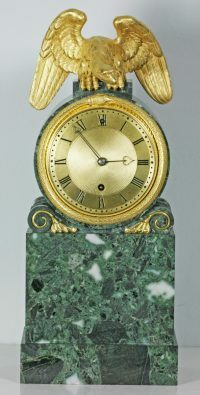 In his years of service he did much to further the good reputation of the clockmakers trade and against increasing odds he succeeded in preserving high standards of craftsmanship which can be seen in almost all of the clocks that he produced. Unlike his father’s main output, which was of ornamental house clocks and furnishing items, Benjamin Lewis tended to concentrate on using the very best of materials and workmanship in order to give long and trouble free life to his clocks. The workforce that Vulliamy used were in many instances specialist craftsman or out workers. There were however a number of staff permanently employed at 68 Pall Mall. In particular were members of the Jump family who, after Vulliamy’s death in 1854, went on to found their own famous and very successful business.